Georg Jensen "Acorn" egg spoon # 85, silver with steel. 2 pieces in stock. Designer: Johan Rohde. Length: 12 cm. Stamped. In perfect condition. 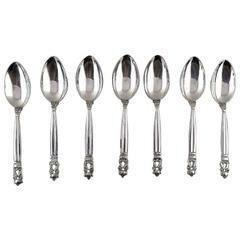 Seven Georg Jensen sterling silver Acorn spoons. 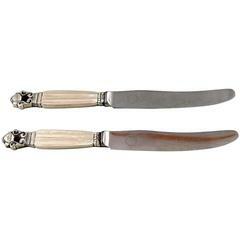 Flatware, vintage spoons in Acorn. Measures: Length 19 cm. Stamped, Georg Jensen sterling Denmark. Good used condition. 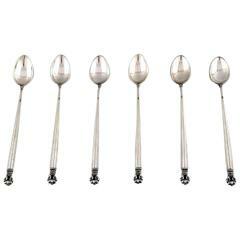 Georg Jensen "Acorn" serving spoon, sterling silver and steel. Designer: Johan Rohde. Measures: Length 20 cm. Stamped. In perfect condition.